At the start of the 20th-century, roe were almost extinct in southern England. Since then, their numbers have soared thanks to an increase in woodland planting and strategic reintroduction. In fact, roe are now the most widely distributed deer species in the UK, according to the most recent population survey undertaken by the British Deer Society (BDS). However, roe are still not really present near my home on the border of Kent and Sussex. There are anecdotal reports of the odd one shot locally, which creates a huge buzz on online forums, but the population is sparse. Dr Karis Baker’s groundbreaking PhD research into the species (which was part-funded by the BDS) found that roe deer actually have quite small home ranges, often less than 100ha, so I may never see high densities of the species in my little corner of England during my lifetime. Luckily, just two hours’ drive west, Hampshire is home to one of the highest densities of roe in the country, along with some of the most impressive trophies. Sporting agent Owen Beardsmore of Cervus-UK has been guiding people for roe in southern England for the past 15 years. Stalking roebuck at the very beginning of the open season is particularly special, as the beech woods are springing into life and the ground is carpeted in sweet-scented bluebells. “At this time of year, roe suddenly start to reappear on rides and glades after their five-month absence tucked away deep in the woods,” explained Owen over supper at The Anchor in Lower Froyle, the night before our outing. Having not shot a roebuck since last year’s rut, I had been clock-watching the season’s return for a chance to stalk Britain’s only truly indigenous deer species once more. The eye-wateringly early sunrise meant a 3:30am alarm call. By the time Owen and I had finished putting the world to rights the night before, it was hardly worth turning in at all. Bleary-eyed and grumpy, I tripped over my snoring Bavarian mountain hound as I fumbled for the bedside lamp. I caught sight of the neatly folded stalking gear next to my bed and suddenly remembered why my sleep had been so rudely interrupted — roebuck! After bolting down coffee and toast, we headed to one of Owen’s premium roe grounds. The dawn sunshine showed the 40ha deciduous woodland, which is a Site of Interest for Nature Conservation, at its absolute best. The luscious greens of the new growth in the understorey seemed to be emitting their own bright light as we stalked along a grassy ride. As I am working towards my Deer Stalking Certificate 2 (DSC2), Owen allowed me to lead the stalk as practice for my forthcoming witnessed stalks. Hunting at the right pace, glassing often enough and knowing how to spot a deer through the most dense undergrowth are all skills I am trying to hone. Fortunately, the most effective way of becoming a better stalker is simply to spend more time in the woods creeping up on unsuspecting wildlife. I was looking for a representative buck — preferably an old six-pointer that was beyond its breeding best. I wanted one that fitted in with Owen’s cull plan, maybe one that he had been seeing regularly on one of his trail cameras. Despite our super-stealthy stalking, the deafening morning chorus was brought to an abrupt halt by a barking doe as she crashed through the ferns with her two young kids at heel. For a moment, everything in the woodland stopped what it was doing and looked up as the young doe stuck a big metaphorical arrow above our heads. I felt cross with myself — I’d made the schoolgirl error of walking too quickly. Sometimes my enthusiasm for deerstalking can get the better of me —more haste, less speed! I was determined that the rest of the stalk would be executed flawlessly, as if under DSC2 exam conditions. With Gretel, my hound, walking beside me, the three of us gingerly passed along the rides. The vibrant bluebells created a stunning backdrop for our stalk. Earlier, Owen had informed me that half of the world’s bluebell woods are found in the UK, and that bluebells are a common indicator species for ancient woodlands, so bluebell woods are likely to date back to at least 1600AD. Every stalk is memorable, but today’s hunt would be forever etched in my mind thanks to the carpet of gracefully nodding bell-shaped flowers. As I scanned the woodland for out-of-place shapes using my binoculars, I picked out the distinctive outline of an ear. Was it an ear — or were my eyes playing tricks? The shape twitched. It was definitely a hairy roe ear — but was it a buck’s? Beech leaves obscured its head and body. I signalled to Owen to freeze. Gretel had already spotted the deer and was fixated on where I was now pointing my rifle. Owen tapped me softly on the arm before sticking a finger either side of his forehead to indicate that the deer was indeed a roebuck. And not only that, it was a shootable roebuck. There were too many obstructions for a clean shot so we waited to intercept the buck as it crossed the open ride in front of us. It was browsing leaf buds and looking totally relaxed. I flicked on the illuminated reticule of my scope. The pinhead-sized dot glowed bright red in contrast to the greens of the woodland. Once on the ride, the buck presented a broadside shot, so I moved the red reticule into the front shoulder mass above its leg and squeezed the trigger. The beast dropped cleanly on the spot. I gralloched the buck, which was around seven years old, in the field and fed Gretel a small piece of heart as a reward for lending her services. It might only be once a year that my deer dogs need to track a lost deer, but I would never stalk without one. As a responsible and compassionate hunter, I think you owe it to your quarry to stalk with a dog that is trained to track both adrenaline and blood trails. We also bagged up the faeces and rumen lining to send to the Moredun Research Institute in Edinburgh, to help with their research into liver fluke, which appears to be on the increase and spreading across the UK into previously fluke-free areas. This buck’s carcase was healthy and clear of any disease and was a welcome addition to the food chain and cull sheet. 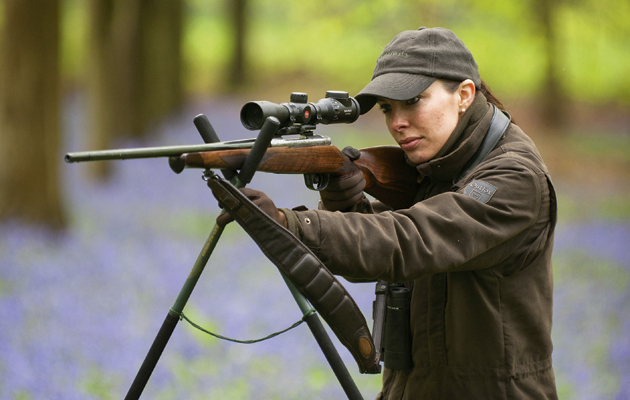 Stalkers from all over the world descend on England at this time of year to experience stalking roebuck in bluebells. If you’ve tried every other type of stalking and have yet to experience the magic of stalking among these cheery native wildflowers, I recommend you go now — they are only in bloom for a few glorious weeks. To test faeces from deer for the presence of fluke eggs and antigen. To examine the rumen lining or contents for the presence of rumen fluke. For faecal sampling, the institute requires a handful of fresh faeces from a number of individual deer (no more than 10). For rumen fluke sampling, it requires you to examine the rumen lining and its contents for the presence of small, pink, maggot-like parasites (pictured right). Infected samples must be transported in ethanol, which the institute can provide in plastic tubes. Contact the insitutute if you plan to send samples so they can provide the correct kit. The address for correspondence and submission of samples is: F.A.O. Gillian Mitchell, Moredun Research Institute, Pentlands Science Park, Bush Loan, Penicuik, Edinburgh EH26 0PZ. Email : Gillian.mitchell@moredun.ac.uk or tel 0131 4455111.